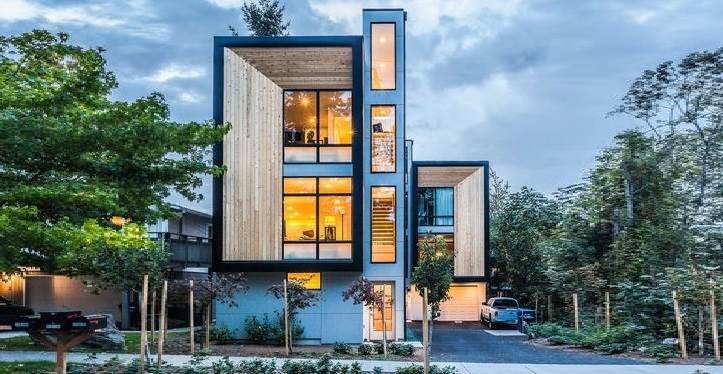 This modern prefab house is a multi-story townhouse mini-complex located in West Seattle. It was designed by Chris Pardo Design Elemental Architecture in collaboration with Method Homes, a company specializing in prefabrated houses. The design team seeks to design innovative, iconic buildings, located in dynamic urban environments. This particular set of buildings has caught quite a bit of attention, so it may be on its way. The picture above shows just one of three such residential units in West Seattle. The prefabs sit on a 5000 square foot lot, and each of the three is between 1250 and 1400 square feet in size. Each has three bedrooms and two and a half bathrooms. The architectural design team works on a range of structures besides prefabricated homes, including commercial, hospitality and civic buildings. And they work on large planning projects as well as residential dwellings. For those considering prefab homes, we have a number of write ups on the pros and cons of the construction method (particularly the pros. I suspect the main “con” is just that it isn’t a traditionally build house, which means that in some cases it will be more “cookie cutter.” Among the benefits, though, are reduced cost (because of a number of factors associated with building modular-ly, in factories (sometimes), and transporting the modular house to the site quickly, as well as the ecological benefits of the same factors). Visit Chris Pardo architecture designs (click here). Visit Method Homes (click here). Previous Article Hot Tub Anywhere You Go?